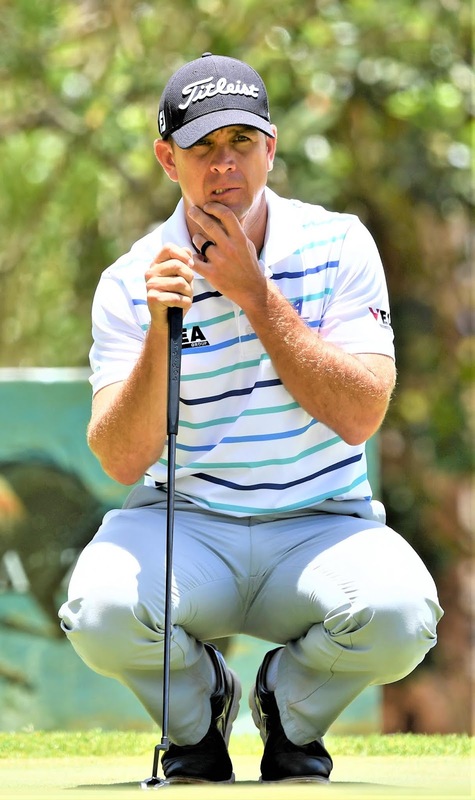 Louis de Jager (pictured) opened up a four-shot lead at the halfway stage of the Magical Kenya Open presented by Absa after carding a second round of five-under-par 66 in Nairobi today. The South African shared the overnight lead with England’s Jack Singh Brar going into Day Two at Karen Country Club, but after bagging seven birdies today he put daylight between himself and the rest of the field. De Jager, who triumphed on the Sunshine Tour earlier this year, will have history on his side going into the weekend because, over the last five seasons, a player has led by four or more shots after 36 holes on 10 occasions on the European Tour – with seven going on to win. Four shots off the pace in a share of second place are Singh Brar and Spaniard Adri Arnaus. Both European Challenge Tour graduates, the pair are well poised to make a charge for a maiden European Tour title after rounds of 70 and 68 respectively today. In contention again is South African Justin Harding, who is five behind his countryman de Jager. The World Number 52, who triumphed in Qatar last week, is looking to become the first player to win back-to-back European Tour events since Justin Rose in 2017. Scotland's Robert MacIntyre made the cut with nothing to spare on 144. Craig Ross (149) and Grantown on Spey's Duncan Stewart (152) missed the cut. "I had to find my feet a bit at the start of the season but I'm feeling comfortable out here now. "I told the guys when we played a practice round on Tuesday, after the desert, you could feel you were in Africa, back in our continent. You get used to the feel of the Kikuyu grass, and the ball travels the same as back home in Pretoria, distance wise, so it really feels like we're back home. "My game plan over the weekend is not to be too aggressive. The most important thing is hitting the fairways and hitting the greens because the greens are quite small. If you hit the greens you've always got a good birdie chance here." “It has been a fun two days. Yesterday I played really solid and today I kept it in there again today. “It was a bit of an up and down round today – a bit of a mixed bag. I had a couple of good opportunities early doors and then missed a good birdie chance on nine which stunted my movement a little bit – then I was a bit scruffy on the back nine. “I was a little bit more aggressive today as you have to get it in close here as it can be awkward in places.